professional design services since 2000.
of all team members to insure a successful project every time. 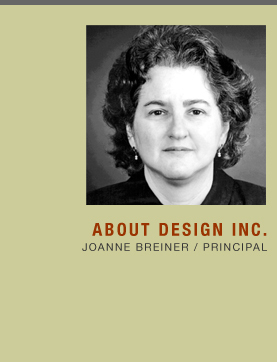 Joanne Breiner, founder and principal of DESIGN, Inc. has over twenty-five years of experience as an environmental graphic designer. This experience includes thirteen years at the architectural firm, SBA/Steffian Bradley Architects Inc., with seven years as Environmental Graphic Design Associate. Joanne received an MFA degree from Boston University in Graphic Design. Her background also includes experience in museum design and planning. Joanne currently teaches a graphic design course at the School of the Museum of Fine Arts Boston.